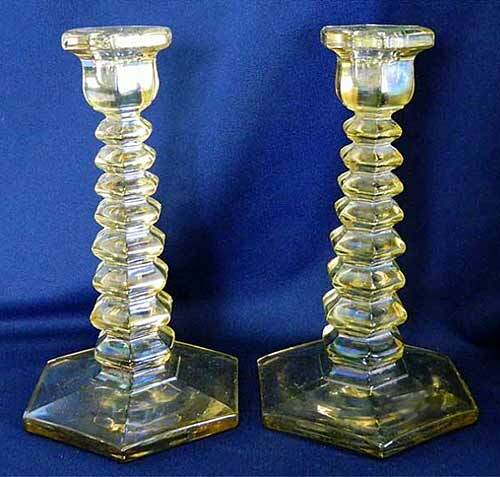 These marigold candleholders were sold at a Jim Seeck auction in early 2012 and simply named Pillars. Harold Mayes, an expert on Westmoreland, thought they looked familiar and found them in both 1912 and 1940 Westmoreland catalogs. 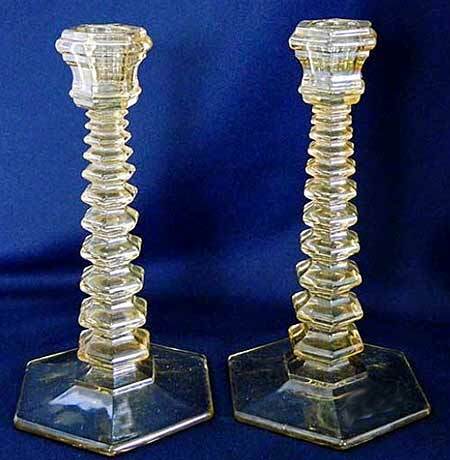 The pair on the left are 8 1/2 inches tall with a 5 1/4 inch base and were designated 1017. They sold for $85. On the right are a pair that are 7 1/2 inches tall with a 4 1/4 inch base. This pair sold for $55. Note that the details differ slightly so this latter pair may be another pattern. Photos courtesy of Seeck Auctions.